Chinatowns all over the world resonate with visitors because they hold a certain talismanic consistency; we know exactly what to expect - from the tasseled decorations to authentic vegetarian restaurants, from dodgy massage parlours to haggling aunties at the wet market and endless rows of shops selling all manner of trinkets proudly made in China. Yet, each Chinatown also exists in its own microcosm; some are more open than others, some more historic and reflective of the larger city. 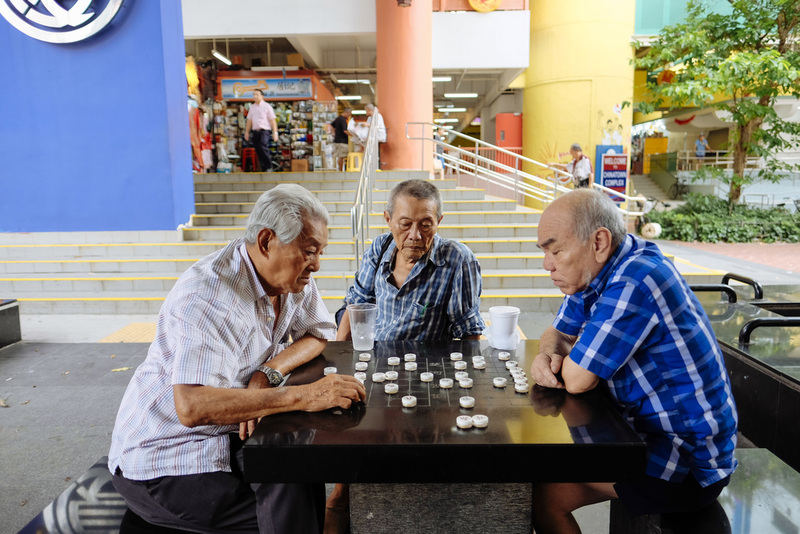 Singapore's Chinatown is no different. Within its boundaries sit places of worship for Hindus, Muslims, Christians and Buddhists; testament to Singapore's multi-cultural narrative. 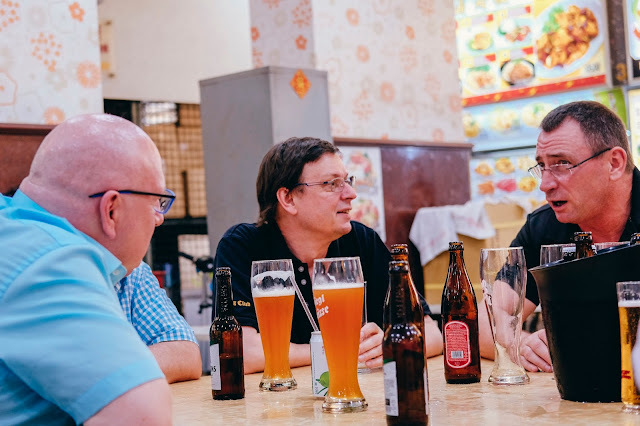 Into this conjugation came Erich Sollboeck, a chef from Austria who first worked with the German Club in Singapore in 1997 after years of being an itinerant chef on cruise liners and working in Germany, China and Southeast Asia – Thailand, Malaysia and Indonesia. In 2004, Chinatown was abuzz with an air of enthusiasm and motivation to start doing business again after the Northeast train line was completed. 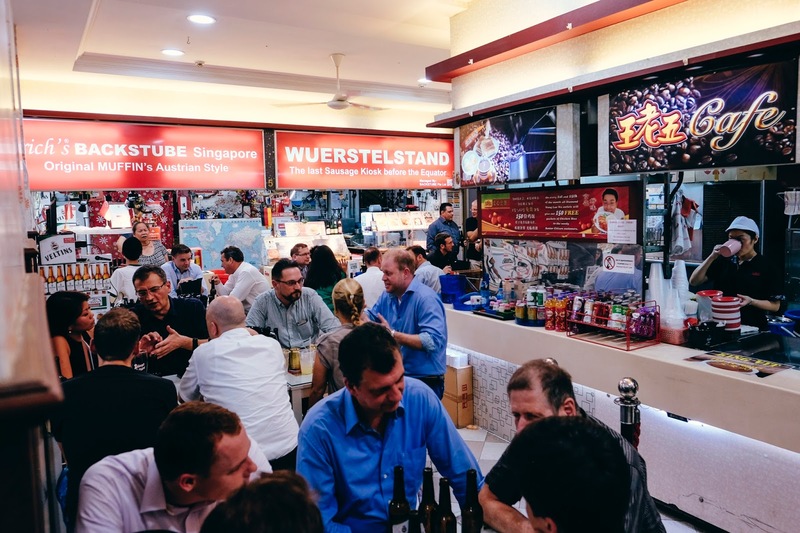 A night market was mooted as part of a revivification of Chinatown after years of construction. 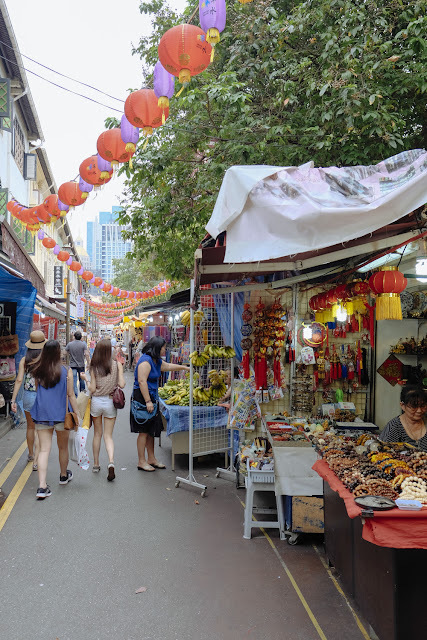 But the Chinatown Business Association (CBA), under the auspices of the Singapore Tourism Board (STB), wanted differentiated pockets of commerce for a night market, something “Western” to attract local residents as well as the tourists. 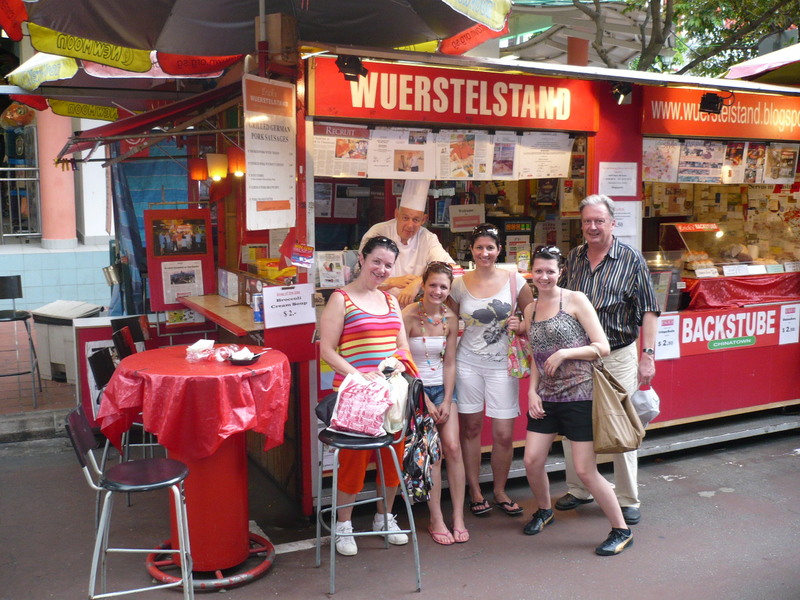 Offered a small space by the CBA, the only thing that made sense for Erich was to open a sausage kiosk. 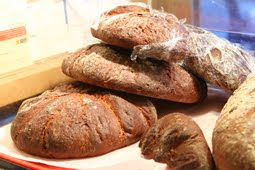 But it was also something that interested him, as it was a good opportunity to get his business started in a vibrant environment, and to give the community a different kind of cuisine. 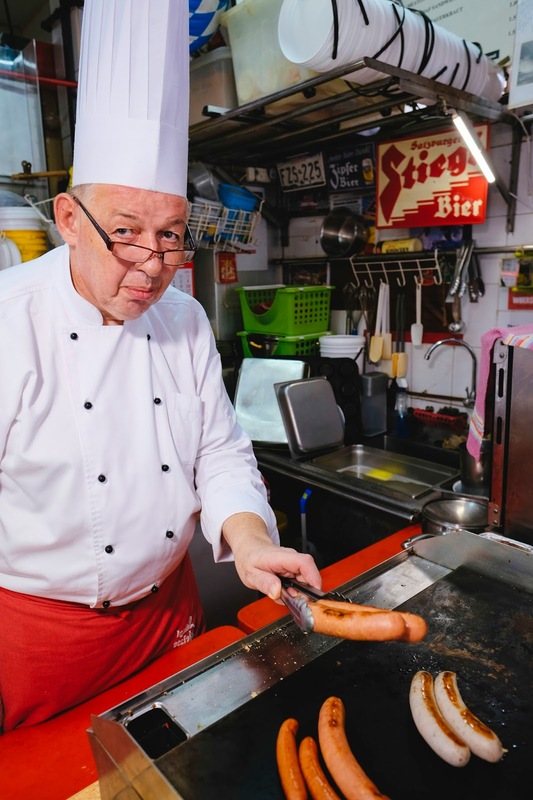 Despite being involved in other businesses then, Erich was given just eight days to get the sausage kiosk up and running from scratch. And he did, despite forgetting his cutting board on the very first day! 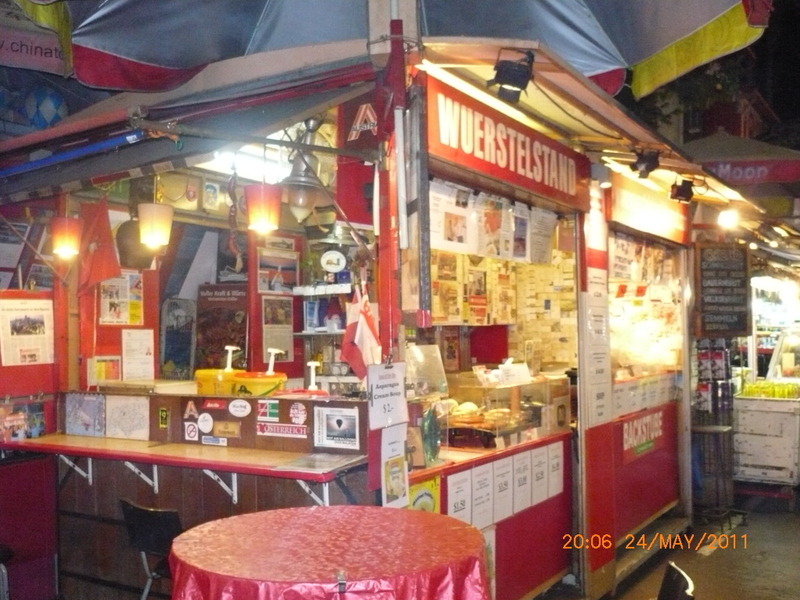 The original stand at Trengganu Street. His original sausage stand on Trengganu Street occupied just four square metres, and when Erich started selling muffins in 2007, he doubled his shop space and rented other units to produce his bread and muffins. Over the years, rent has gone up, and he hasn’t always managed to continue to sell all of his products (muffins went on hiatus for a few years) due to limitations on space, but over the years, he seems to have settled into his burgeoning reputation as the sausage man of Chinatown. 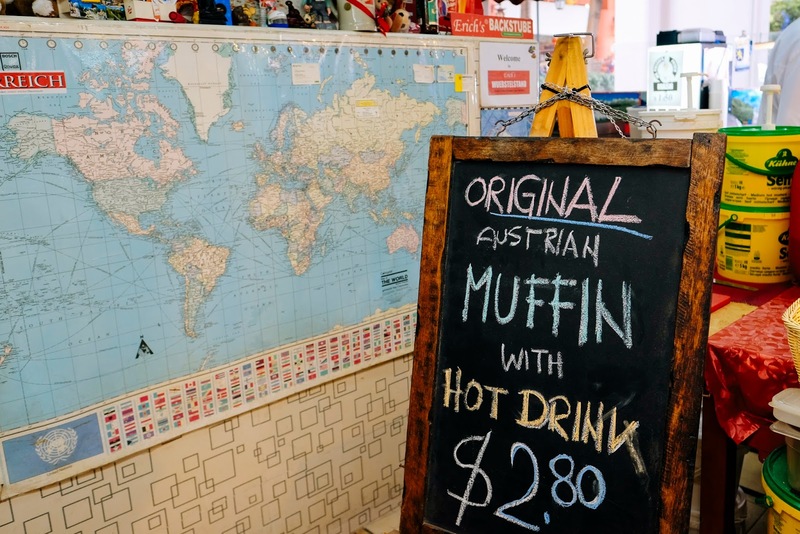 In 2013, Smith Street was turned into a covered pedestrian-only food street, but that coincided with Erich’s timely move to his new unit 50 metres away, occupying a double unit in a coffee shop on Banda Street. Mackerel: After such a varied career, why settle down in Singapore? Erich: We sometimes measure our needs with our wants, and yes, in the system we have now, it is required that we need money. But if you look at yourself and not at others, and always running after something, like a carrot dangling in front that only gets further and further, you won’t get anywhere. Look at yourself - what are you satisfied with? What are your abilities? What are your contributions are to the community? You’ll find that with pretty normal things, you can get along. It’s entirely up to the individual; no one else can do it for you. Mackerel: Has commercialisation overtaken Chinatown in recent years? Erich: Chinatown has gone through periods of success and moments of stagnation. 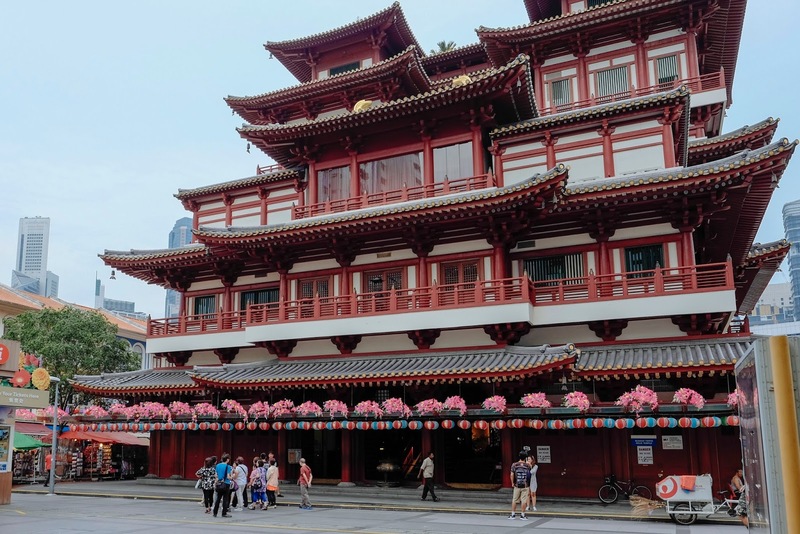 When the Buddha Tooth Relic Temple was opened in 2007 it brought another wave of visitors, but the Chinatown food complex was closed for two years in 2008 for renovation, and this affected surrounding businesses, especially when coupled with the 2008 financial crisis. In the midst of this came a growing awareness to balance commerce with heritage. The commercialisation of Chinatown is a simple consequence of doing business; it’s about making business viable. But the thought of heritage continues to persist even for landlords. Though they need to have a yield on their property, landlords have recognised that they need to have a more conscious approach to heritage. 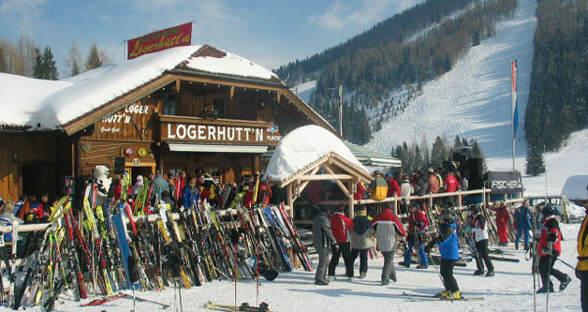 Businesses cannot keep to their ‘any means necessary’ approach to selling their wares to tourists. They need to have a concept, and to recognise that they are part of a community. And every action has a communal consequence. Heritage groups will never interfere in the commerce of Chinatown, but if commerce overwhelms, it compromises the heritage quotient of Chinatown, and that is really what tourists come for. The community of Chinatown is diverse and respected. One of the living rules we practice on a daily basis is respect and tolerance. Then you work. 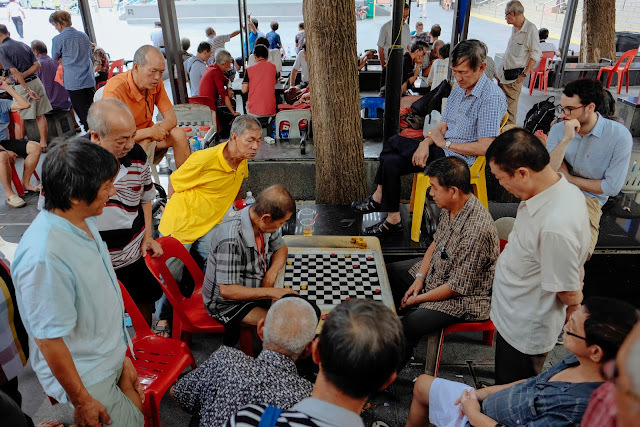 There is always a crowd to watch Chinese chess maestros face off at Kreta Ayer square. Erich is a one-man operation with hardly any assistants. Whatever he can do, he does by himself. Having a background in hospitality, he ensures that his source ingredients are pre-made according to his high standards and covered by production agreements so that he doesn’t need to prepare them from scratch. He’s there everyday from around 11am to 9.30pm. 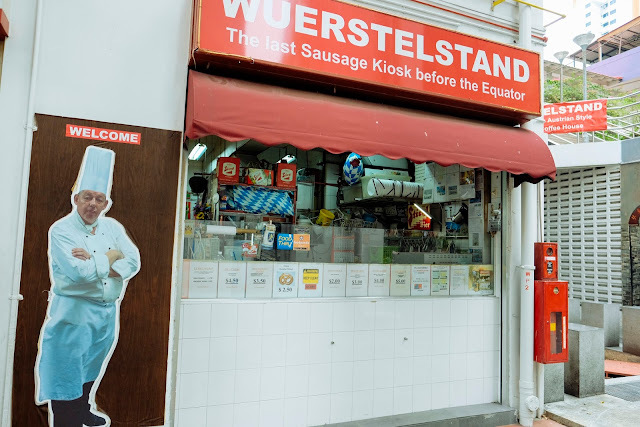 Long hours, but what drives him aren’t so much the sausages but his customers. He takes time to joke and trade good-natured repartee with each of them. And just hanging out at his stall for a few hours, it’s obvious that he has a whole host of regulars. Expanding on the bread-and-butter of his trade, Erich explains that there are so many different sausages and every cook makes something different. But even if you want to stick to the basics, you still need a structure. Mackerel: So what’s tried and true? Erich: People like a German bratwurst. Because it’s not smoked. But people also want a smoked version. Then you have the kasekrainer, it’s the one with cheese, just like in Austria. And then a smaller sausage like the rostbratwurst. That’s about 80% of the general sausage demand. And then I ensure a high quality for these sausages so that people will know where to go for good sausage. Mackerel: What keeps you going? Erich: You. Not as a person, but as a community. Everything that goes on around me keeps me going. In the morning I wake up, I learn something, I say thank you. And it goes on. The whole day. There is a multitude of events and actions throughout the day that keep me occupied, so I’m never bored. And of course, I have the best customers in the whole world. They are polite, they’ll wait while I’m busy (being interviewed!) 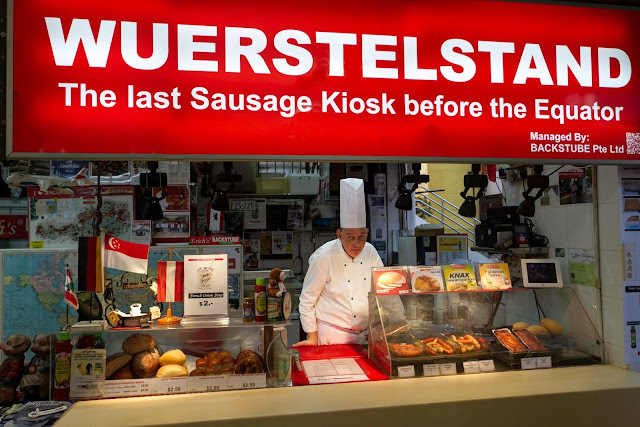 and as soon as I’m done, they’ll come back to order their sausages. We pop by on the first Friday of the month to catch a unique sight; an entire coffeeshop full of Germans, downing beers and feasting on sausages and sauerkraut. A karaoke machine is set up, in case anyone feels like singing songs of yore. There are no takers tonight, everyone is too busy chatting and catching up. Erich beams from behind the counter; this is clearly what he lives for. And so life goes on in Chinatown. 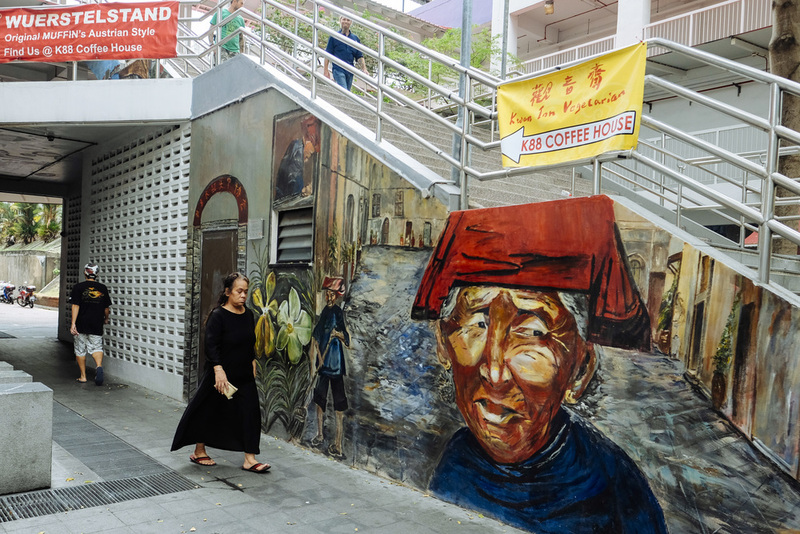 A new mural showing the samsui woman as an integral part of Singapore’s history has gone up just behind Erich’s coffeeshop. 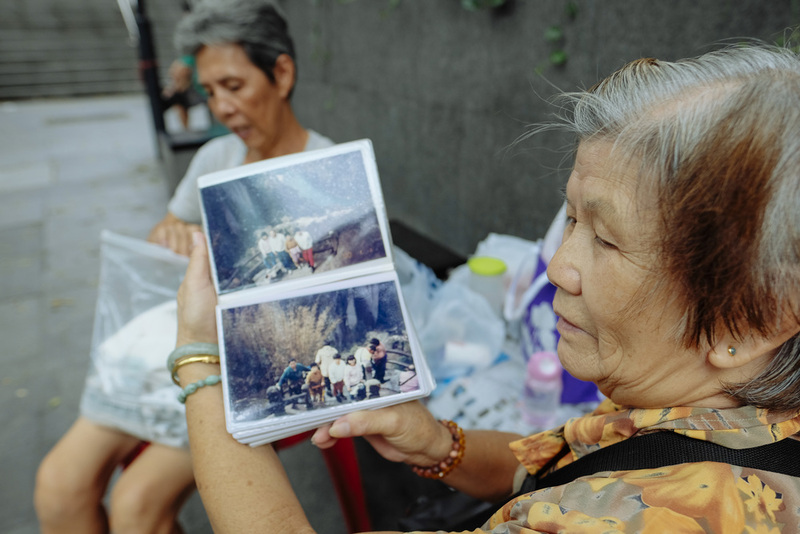 Two elderly ladies flip through a photo album of their youth, and young and old men alike gather to watch daily xiangqi (Chinese chess) battles in the lee of the temple. This is the community that Erich has come to call his own, and long after the tourists leave town, it is community that continues to endure. 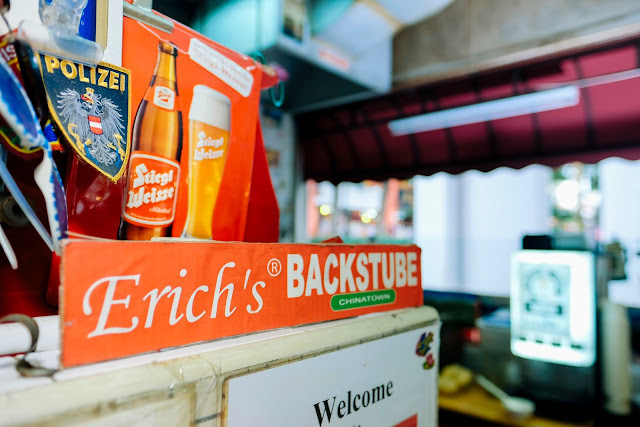 Directions: Erich’s Wuerstelstand is at K88 Coffee House at Block 5 (the corner coffee shop behind the Kreta Ayer People’s Theatre stage) at Banda Street, #01-52. Unless otherwise stated, photos by Mackerel.